Ms. Collins is a graduate of the Peabody Preparatory (certificate), Pennsylvania State University (BM) and Southern Methodist University (MM). An active performer, she is currently second horn with the American Studio Orchestra and third horn with the Black Pearl Chamber Orchestra. 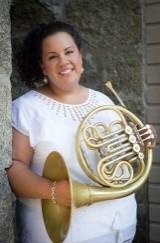 Ms. Collins has performed with several notable ensembles, including the Dallas Symphony Orchestra, Dallas Chamber Orchestra, the Washington Opera Society, Opera Memphis and the Lyric Brass Quintet. She is currently a member of the Kupra Quintet and Prizm Chamber Ensemble.